How can I show only specific layers in my Strater cross section? 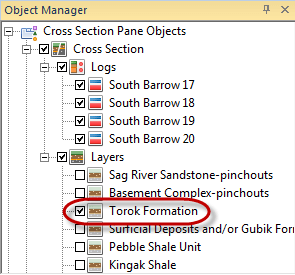 To show only a specific layer in a cross section, turn off the visibility of all the other layers by unchecking the check box to the left of the layer name in the Object Manager. A check mark means the layer is visible. No check mark means the layer is invisible. Select which layers you want visible in your cross section. How can I reshape the Strater cross section layers?